The spring selling season continued to gain steam last week as weekly existing home sales volume improved for the fifth consecutive week while home prices remained above last year’s levels for the second consecutive week according to the National Home Sales Snapshot released by DataQuick. There were 163,984 properties sold over the previous thirty day rolling period ending April 12th, up 4.1 percent from the previous week’s total of 157,452 properties sold and 13.5 percent higher than the 144,419 properties sold four weeks ago. Sales volume is still down 14.1 percent from the current year’s cycle peak of 190,934 sales which occurred during the 30-day rolling period prior to September 1st. Last week’s home sales volume was 3.2 percent higher than the 158,905 homes sold during the same period a year ago and was 9.0 percent higher than during the same period three years ago when 150,491 homes were sold. 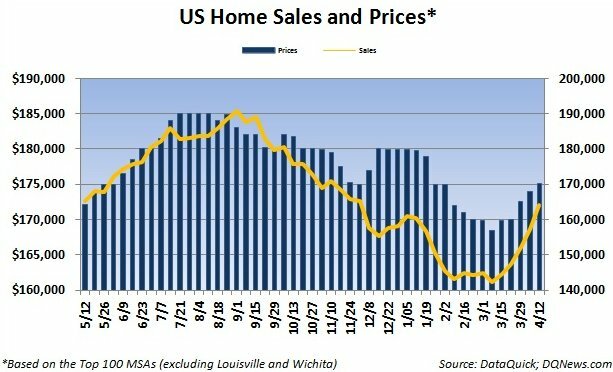 The median price of a home sold over the current thirty day rolling period also improved for the fifth consecutive week, increasing by $1,150 from the previous week to $175,150 and is at its highest level since the end of January. Home prices are up 3.1 percent from a month ago. Home prices were 0.1 percent higher than the same period a year ago when the median price of a home was $174,900 but were still 2.7 percent lower than the same period three years ago when the median price was $180,000. It was the second consecutive week that year-over-year home prices surpassed the previous year’s levels.